Oh I wish I had spiritual insight on how to streamline my miniature collection to make our moving process much easier. I am having difficulty sorting through tiny furniture pieces and deciding what to sell, what to give away and what to keep. How does one stop liking material goods and things and things and things? Don't get me wrong, I'm not wrapped up in brand names or all that "what's hot/what's not" B/S...I just like my modern miniatures. Is that so wrong??? Well,...I guess I am asking the wrong audience, aren't I? The storage unit is from the DHE. The sofa and matching chairs are Bodo Hennig. The coffee table is Paris Renfroe (PRD). The art is Rex Ray. All accessories are Character Options, Plan Toys, Re-Ment, Lundby and Bozart Toys. love your blog. 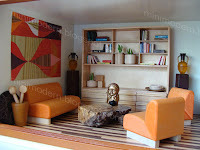 I am really into modern/contemporary and mid century modern miniature design. Can't wait to dig into some of the goods on this site. Yep - I totally understand about the coveting of (mini) material goods. If you happen to part with those lovely bodo hennig sofas, I can offer the poor sofa orphans a loving home. 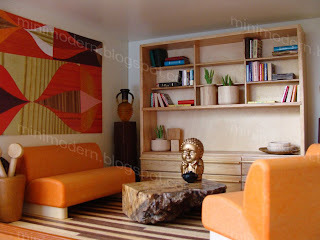 I love this living room... it makes me miss my orange ikea fake velvet futon from college! Yes, most of us here are quite crazy about this modern miniature stuff. The Rex Ray art is actually from a set of postcards that I purchased from the MOMA. The postcard section at the MOMA is thee best place I have found to find miniature modern art. Good luck finding a suitable dollhouse for your little one. You've given me so much inspiration in your blog. I too am moving at present but when I am settled again I'll be buying a new, modern, dolls house. This will be my feeble attempt to do something of the quality of yours. Keep up your great work and if any of the furniture your relinquishing fancies a move to the UK, let me know! I hope you too start a blog and share your hobby. Lovely room MC! Seeing this makes me kick myself for not purchasing the DHE shelf unit when it's on sale a few months ago. Good luck with your move. So are you going to move to into an Eichler? No worries--That shelf is bound to go on sale again. Thanks for the luck as I will need it. I wish we were moving to an Eichler, but instead, we are moving into temporary diggs--that we can refer to as the "decision house"-- until we decide if we really really really want to stay in CA and reinvest our money in the real estate market here or head back to where our families reside AND where our hard earned dollars buy much much more. The new place is nice though. I can't really complain. It's another mid-century ranch in a quiet neighborhood with lovely Bay views. The place is a peaceful environment for decision making.